I have decided to share with all of you just a little bit of everything I have learned while training my mad band of loons. I can't pretend to be an expert or a genius, but what I've done has got me the results I wanted, so maybe it could help you as well? The truth is that there isn't really a right or wrong way to train a horse. Yes, there are things that should or should not be done, for example you should make sure your horse is ready before you jump it and you should not try to teach a horse through fear. Other than these very important issues, I find that every horse and every rider is different. You need to find what method works best for you and your horse and do what it takes to get the result you are looking for. Now, before I begin I will offer a brief outline of what I have done with my methods, because obviously nobody will want to hear about what methods I have used if they think they won't work! I've retrained three racehorses, I've backed two thoroughbreds and one pony and I've fixed problem horses. One of my retrained racehorses, Finola, went on to be one of the best showjumpers in the country. She would have been the best 1,20m junior jumper in our province in 2008 had she not been injured. See my article about her for the full story. My other retrained racer, Polo, has had quite a few important achievements in lower grades, but the more incredible thing about her is the fact that I will comfortably jump a 1,20m course on her in just a halter at home. See this article for her full story. One horse that I backed is Bronze. I've jumped 1,55m on him at home and, thanks to the help of a great dressage instructor, we won our second Welcome (80cm) eventing and placed 4th in our first Pre-Novice (90cm) eventing. We've had a few good places at 90cm and 1m, though he was never quite brave enough to do well in a showjumping arena. We have got around two 1,10m courses though! The other horse I backed was my dear Choc horse. I have had her since she was a month old. She is now 5 years old. 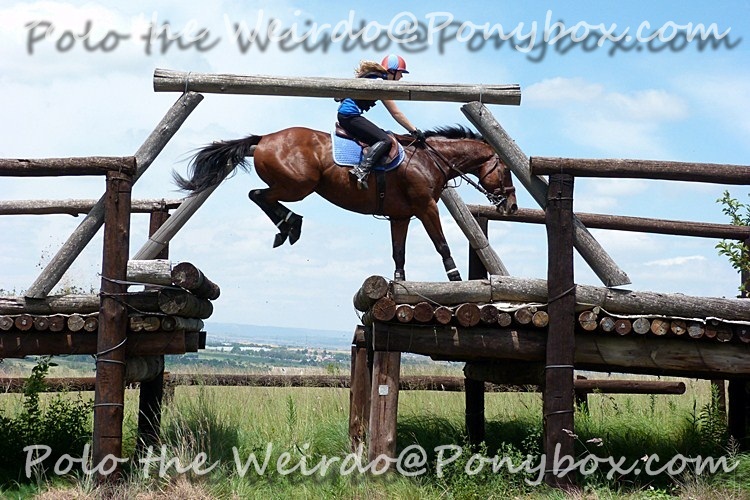 She has done three events, two in Welcome and one in Pre-Novice, and hasn't put a foot wrong in the cross-country! Not once! Out of two 90cm competitions (Two classes per competition) she has got two first places and one second. 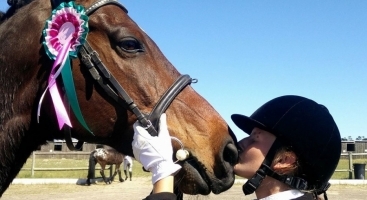 She recently recovered from a colic operation, and came back with a bang to win an 80cm competition after that. She's really an amazing horse with loads of talent, and I can see a great career as a jumper and an event horse awaiting her! 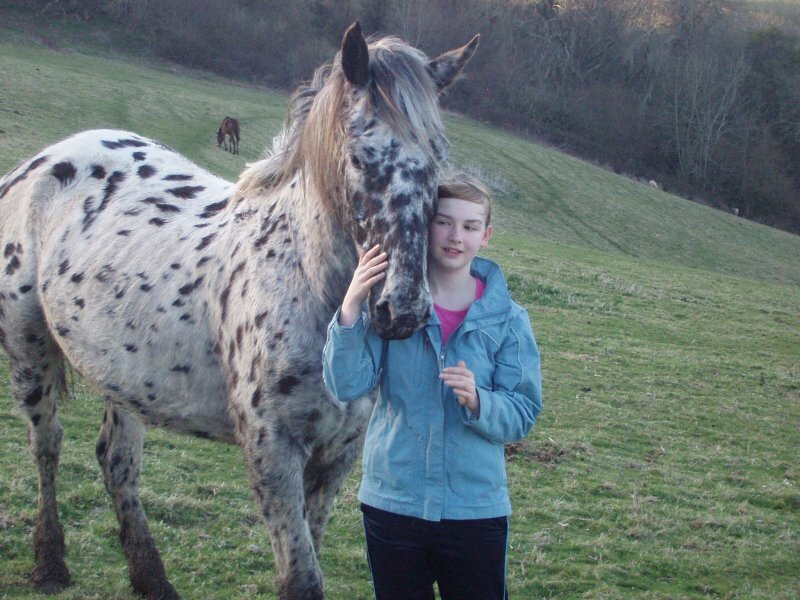 Lastly, the pony that I backed, Tempest, went on to be one of the best pony showjumpers and eventers in the province, despite being only 5 years old and about half the age of the other ponies, most of whom had been at the top for years. 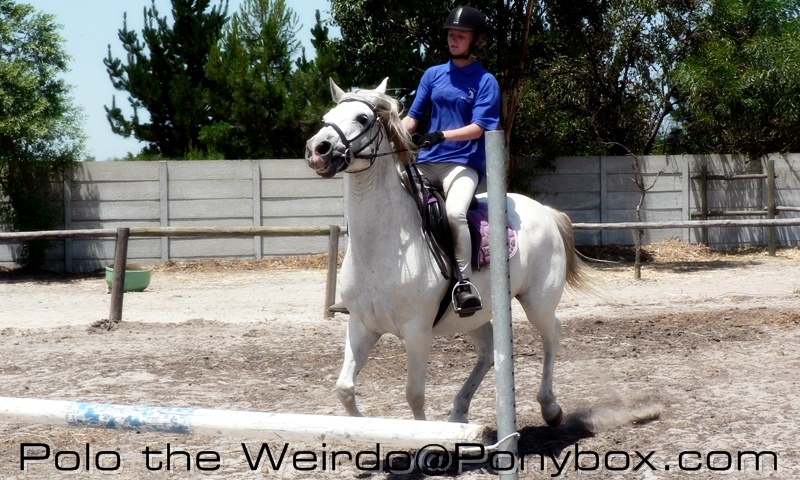 Well, I think that works as a brief summary of my experience in horse training and the results that came of it. Now, if you still want to hear what I have to say, then please read on, because this will be the important bit! I'm not going to be telling you exactly how to train your horse. That is completely nonsensical, since every horse is different. What I will be doing is letting you in on the common problems I have had to face, and what I did to solve them. That being said, the best way to train a horse is to use your instinct and do what will work for yourself and your horse. We all face this problem at some stage in our lives. I have had a few horses that drove me completely crazy with it, and I found a few different methods that worked with them. Firstly, you must be consistent. You must let them know that what they are doing is wrong and never offer them a chance to get away with it. You can't pull against them, or they will just pull harder. Keep your hands low, soft and elastic. Try using your seat and your voice to calm your horse, sit deep and try to encourage them to wait for you while approaching the jump. If they still try to rush, calmly circle them in front of the jump. Do not let them jump until they are willing to do it your way. 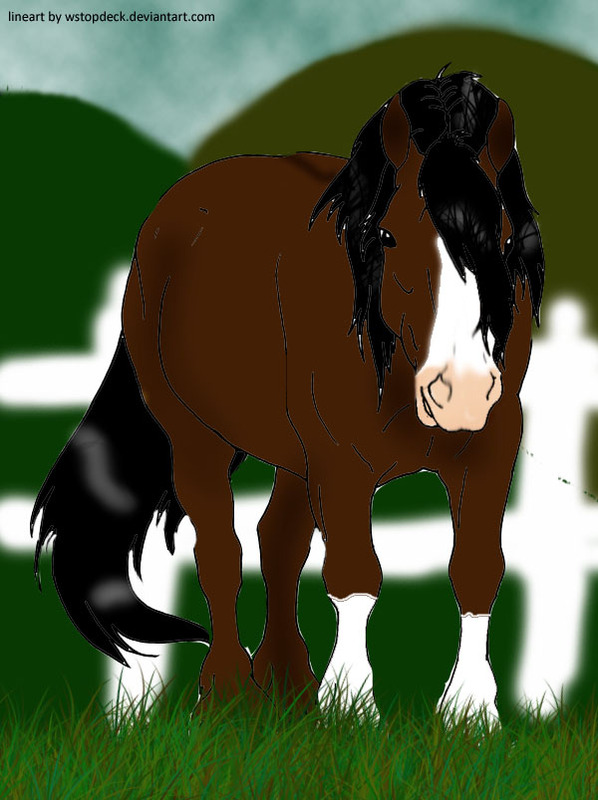 That is a brief idea of how I would ride the average rushing horse, but training them is a different matter altogether. The most important things for a rusher are pops. Pops, pops, pops! We all love them! 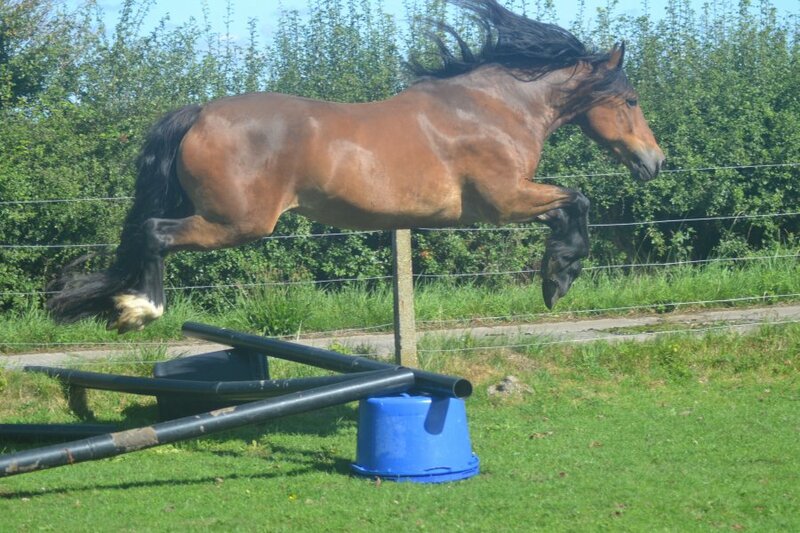 Now, before you ask, 'pops' or 'bounces' consists of a line of fences with just enough space for the horse to touch down between them before jumping again. There should be between 3 and 4 human strides between each jump, though this varies depending on the horse's stride. 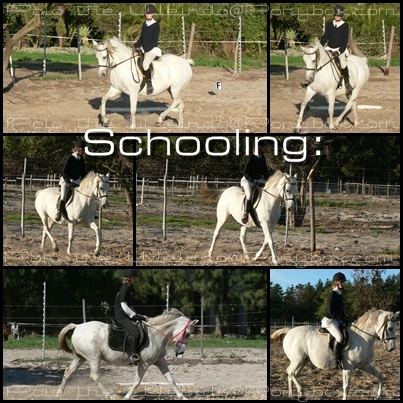 What I would do is start quite short, since we are training our horses to shorten and calm down. At first, keep this line of pops as low crosses. 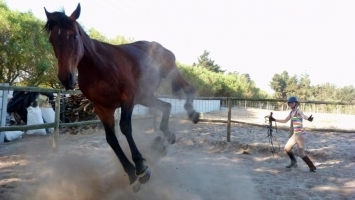 Come in at a trot and let your horse jump calmly through. A horse cannot rush while jumping a line of pops. It is physically impossible. So just keep your approach calm and make sure to slow them down quickly afterwards. Remember to keep a hold on your horse's mouth between the jumps, but be soft with your hands and try not to jab him over the jumps. It is very important that you keep your contact though, because if you have a horse as crazy as my Tempest pony you might find yourself popping neatly down the line, then being launched over the last pop as a single 3m wide parallel. This is strongly discouraged, as it goes completely against what we are trying to achieve, though it is somewhat hilarious. All the same, let's just make it a 'no-can-do' shall we? Anyway, once your horse has got the gist of the pops and is jumping through them calmly, adjust your line so that is goes 'pop-pop-stride'. We now have a low cross, 3 or 4 steps into another cross, 3 or 4 steps into another cross, and 6,5 or 7 steps into another cross, or a low upright. (Whichever you prefer, I usually go for the upright.) Now the horse has a stride to put in which will give him an opportunity to rush if he wants to. What we are doing is testing the success of our pop method. We are hoping that he has learned to stay calm and will jump calmly through the line just as he did when it was all pops. If he does not, then put a placing pole between the last pop and the 1-stride. That way he should land, take a stride over the pole, and jump. This makes it very similar to the pops, except that it is a pole on the ground and not a cross. 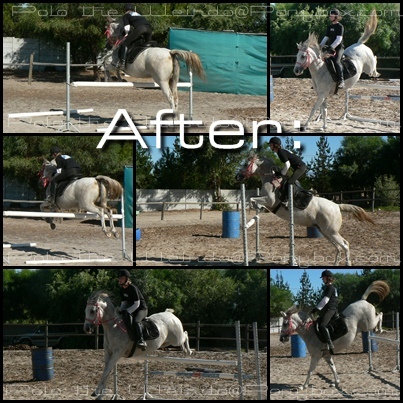 Once your horse is doing this well and you feel comfortable, add 2 strides to another jump onto the end. This should be +- 11 steps, depending on the horse. I'd usually go with 11 or 10,5 since we want our horse to put in short strides. Of course, there is a limit to how short a horse can go and we do not want to injure him, so you must judge your horse's stride for yourself. Again, use your placing poles if you have to. 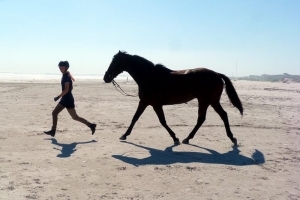 This is your horse's big chance to rush, since he now has 2 pops, a 1-stride and a 2-stride. He could get longer and longer and faster and faster as he goes along, but we must let him know that he is supposed to stay calm. Hopefully he has learned to apply what he learned with the pops by now, but we cannot assume that so be vigilant! Keep his strides even with your seat and voice more than hands and legs if you can, since both these might hype him up a little. Often I find a good thing to do is to put placing poles before and after the last jump to guide where you want him to take off and land. I'm afraid I do not know the distances off the top of my head, since I just played around with mine until they got the desired result out of my pony. I think I had them about 2,5 steps away in the end, but these distances vary hugely. Well, we are now hoping that this exercise has helped some, since it has never failed to show me some improvement before! The next step is to try individual jumps. Trot, trot, trot! You must trot into them before you canter in, since horses tend to be less inclined to rush in trot than canter. 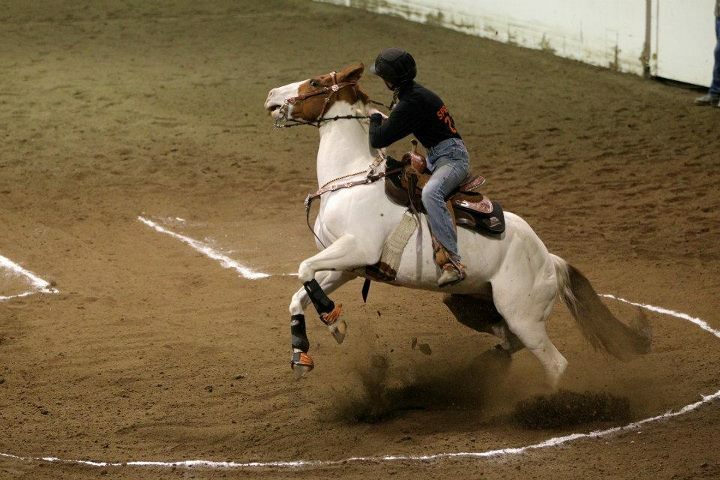 If your horse still tries to rush, calmly circle him before the jump and ride him in when you feel ready. Play with your placing poles and trotting poles if you feel they will help, though we are hoping that by this stage your horse is being sensible and obedient. 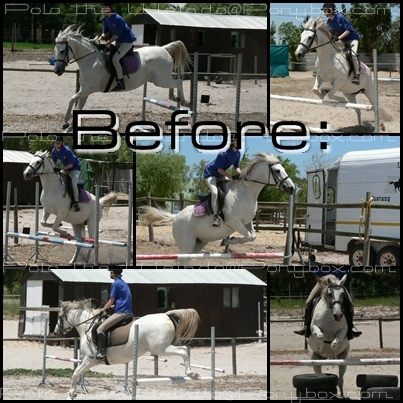 Once he's calmly jumping single jumps, start doing short sequences, then slowly build up to a course. 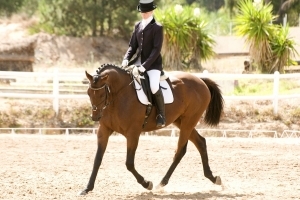 Co-ordinate between trot and canter between the jumps to keep your horse responsive. Half halt often. Use your voice and seat a lot, since hot horses are often overly sensitive to hands and legs and overusing these aids can aggravate them into rushing. Well, that is pretty much all I can say about that exercise. That is my favourite one and it has worked very well for me. 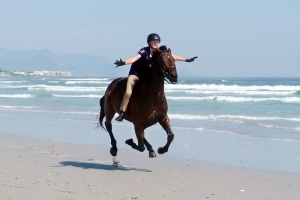 Another good exercise is to make your horse halt immediately after the jump without letting him turn first. A lot of people I know swear by this exercise, but I have always found it gets my horses too tense, and it seems a bit too urgent, rough and desperate. It can work very well for some horses and riders, but I have not found it particularly useful. Still, if my exercise is not working for you, perhaps it is a good idea to try this one, though obviously as calmly and gently as possible, since tension encourages a horse to rush. Another thing that can help a lot is collecting and extending in schooling. 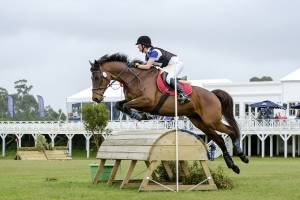 Get your horse really responsive to your 'go and woah' aids (Subtle aids, please note! No yanking and booting!) 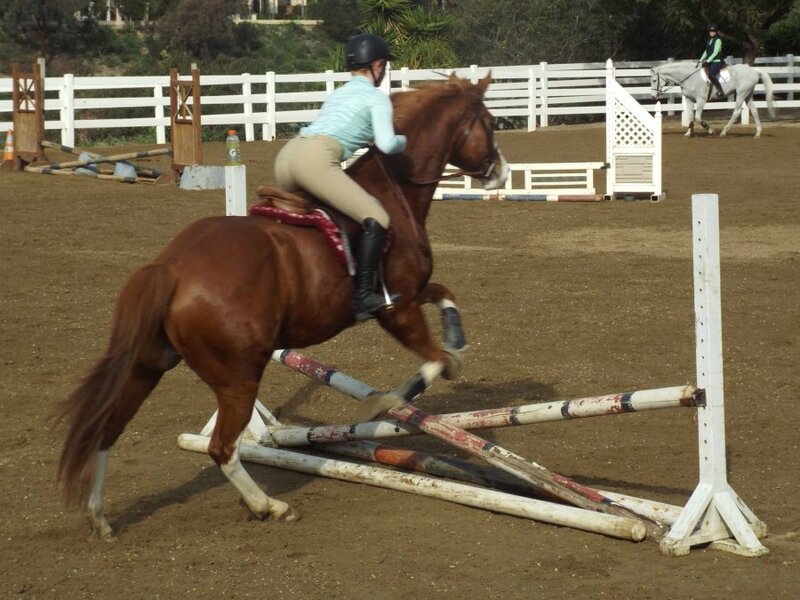 Then he is likely to be more rideable over fences. Make sure to give him a nice long warm-up before jumping him try lots of basic dressage. Figure eights, serpentines, spiralling on circles, collecting and extending. Develop his balance, bend and obedience. Lastly, and possibly most importantly, is the reason your horse is rushing. Different horses will rush for different reasons and we must ride and train them accordingly. Often it will be fear, pain or excitement. Obviously the first thing you should do is have your horse's tack, back and teeth checked. If you are lucky, you'll find your problem here. Then you don't have any behavioural issues to overcome. If this is the case, make sure to sort your horse out quickly, since we don't want him getting into bad habits due to pain. If it is excitement, as is most common in a young horse, you will just need to work through it and teach them how you want them to go. Fear can be trickier, since you have to keep them very calm all the time and make sure you don't use force at all. 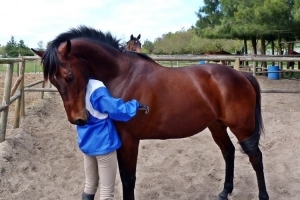 A scared horse is usually very sensitive and can become dangerous if handled incorrectly. All that being said, remember to keep your schedule mixed up. Don't do the same thing every day, keep your horse interested! If he gets bored, he will just start rushing again. 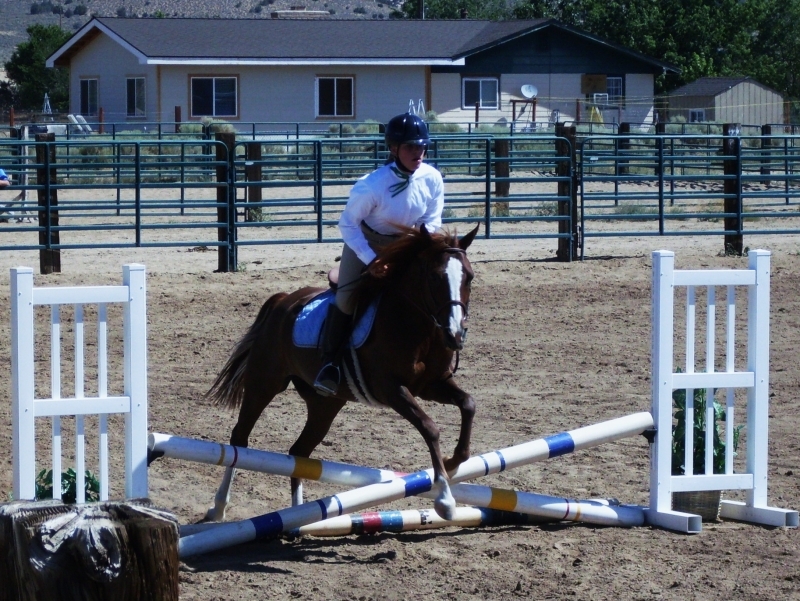 Mix up your jumping exercises, do some flatwork and some hacks. Keep your horse happy, healthy, eager and interested! I hope some of you are able to get some good results from this. Again, it is only what has worked for me, so please do not expect miracles. Still, if it worked for me then it might just work for you! I sincerely hope it does! Next time I find myself with some free time, I will continue this article with the next behavioural problem I have had to tackle, though I have had the most experience in rushing. You are a amazing rider! Pretty example pony and good article! Pretty pony and nice article.